NASHVILLE TENNESSEE Vending Machine Companies! 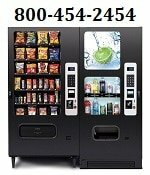 Offering FREE Vending Machines: Snack, Soda, Coffee, Deli, Drinks, Food, Frozen, Healthy Vending, Micro Markets, Amusement Games, and Repair services for your employee breakrooms. Please contact these vending machine operators directly for more information about their vending products and services. B&H Vendors, Vending Services – Vending Machine services, Food, Candy, Office Refreshments and Snacks – based out of Nashville. Par Vending of Nashville LLC – A Full service vendor offering vending machines for snacks and drinks (Coke & Pepsi) sandwiches and office coffee services. Family owned and operated since 1991. Based out of Goodlettsville, Tn 37072. E-mail parvend@comcast.net. Call Par Vending at 615-851-0432 today! Shaw Vending – Vending Machine Services, Specializing In Snacks, Soda, Drinks, Office Refreshment services – Based out of Nashville, Tennessee.